The major retrospective Runge’s Cosmos. The Morning of the Romantic Era is dedicated to the great artist of German Romanticism – Philipp Otto Runge (1777-1810). This year, to mark the 200th anniversary of his death, the exhibition Runge’s Cosmos pays tribute to his artistic genius. It was Runge’s desire to unite the different genres of the arts, poetry, painting, music and architecture in one great overall vision – an approach that was a major innovation in the history of the art. In his famous paintings of the Small and Large Morning he gave suitable expression to a typically Romantic understanding of nature based on cycles of life, the seasons, and the times of day. Runge also made a major contribution to the genre of portraiture. 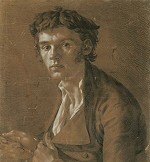 His self-portraits testify to his questioning and reflection of himself as a person and an artist. This presentation of 35 paintings and more than 200 drawings along with 50 cut-outs covers the entire range of his oeuvre. At the core of Runge’s Cosmos is the artist’s struggle to find the best means of conveying his ideas. From the first concept sketch through to the finished painting, viewers are given the impression of being able to look over the shoulder of this visionary painter at work. The exhibition welcomed 130.000 visitors.